Greta and I believe it’s important to travel at this stage in our lives, while we are still physically able to do so, and we feel it’s important to keep our bodies moving and minds active on each trip. We both wear Fitbits on our wrists, which record the number of steps we take, and in Madrid we knew we’d be taking lots of steps. We put those Fitbits to the test before reaching our first hotel in Spain. Madrid’s Barajas International Airport is enormous. It took us 2,500 steps and a seven-minute shuttle train ride to get from the airplane to the luggage pickup area. The taxi driver, who drove us from the airport to downtown Madrid, delivered us to the wrong hotel, even though we had shown him our reservation print-out, which included the address. “It’s a 12-minute walk to your hotel,” a desk clerk at the wrong hotel told us. “It happens all of the time.” Twelve minutes of walking turned into 30 minutes. Along the way, we saw another couple walking in the same direction—looking like us—rolling suitcases and holding an identical hotel reservation print out. “Looking for Hotel H10?” we asked. Yup, their taxi driver also dropped them at the same wrong hotel. They were from Wales in the UK. We had a small laugh together. Lots of Fitbit miles that day. Our correct hotel was located adjacent to Retiro Park, the largest park in Madrid. A mile and a half walk from the hotel through the park took us to the Prado Museum, considered to be one of the great art museums in the world. A visit to the Prado was our top to-do item in Madrid. In the park, there is a small lake where rowboats are rented. There had to be 200 boats on the lake with people rowing when we walked past. Also in the park, we visited an all-glass historical structure called the Crystal Palace on the way to the Prado. My favorite painter is El Greco. There is an entire room devoted to him at the Prado, an El Greco-lover’s paradise. Goya, Velazquez, Rubens and other renowned world painters are featured at the museum as well. Our second to-do item was to eat delicious paella. Twice, we ate paella at sidewalk restaurants in the Plaza Mayor, a well-known square in Madrid. Greta and I love riding trains in Spain. One day, we rode the Madrid Metro to the Chamartin train station and took the high-speed train to the ancient city of Segovia, a 30-minute ride. The Roman-built aqueduct in the heart of Segovia is very impressive. Not far from there is the massive cathedral of Segovia, which by itself is worth the day-trip from Madrid. The cathedral has 27 chapels. We marveled at how difficult building a structure that large and beautiful must have been in the 1500s. On two of our Madrid days, we didn’t plan anything specific—no museums, cathedrals, castles, flea markets or art galleries. We just set out walking in different parts of this fascinating city. We always came upon fun things to see and do. We walked down a busy street called the Gran Via, which has magnificent building architecture and all kinds of shops, stores and restaurants. On that day, we bought a Real Madrid football club jersey for me and a bota bag wine skin for us to take to the Dana Point outdoor summer concerts—filled with vino, of course. We didn’t even buy any ice cream that day, which is hard not to do in Europe, as ice cream is a local favorite. In the streets of Madrid, you see lots of mimes posing motionless, dressed in some exoteric costume. Some are very original. 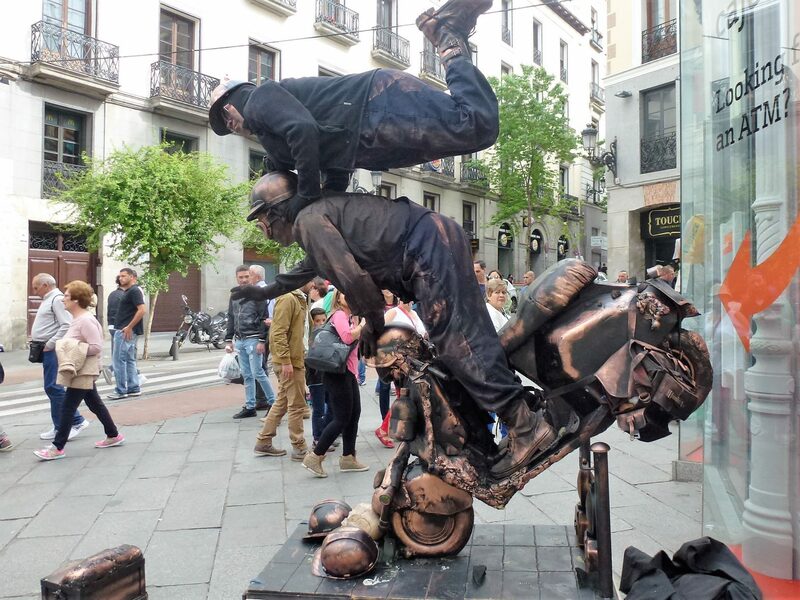 But, these two, pictured below, in the crowded Plaza del Sol on a Saturday afternoon, took the cake—suspended in the air on a motorcycle. How in the heck did they pull that off?